It was a big honour for us to be invited at the African Fashion Designers Expo 2017, which has been celebrated on Monday, 28th of August, at the World Fashion Centre. 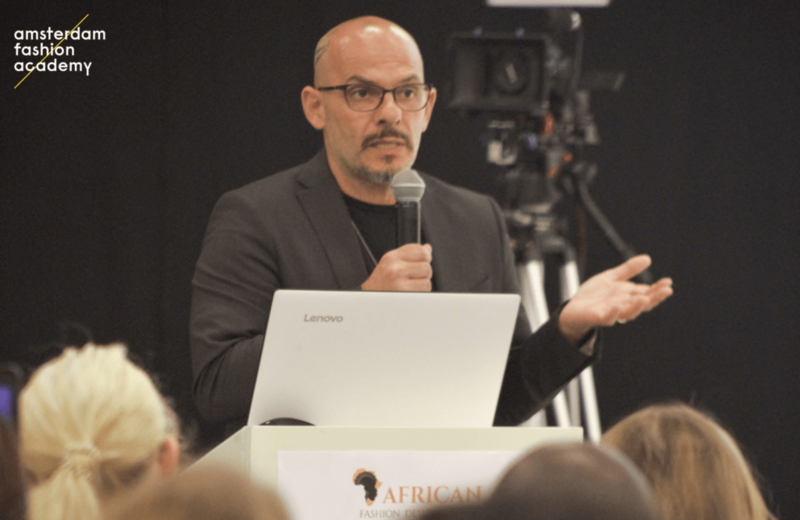 Our new Senior Lecturer, Cristiano Carciani, gave a speech about the European fashion market, in front of professionals of the fashion industry from Nigeria, Ghana and other African countries. To understand the actual European fashion market, Cristiano made an overview of the fashion design history from 1858, when Charles Frederick Worth begun designing complete collections for his clients and sawing his personal labels on garments he created. Q. Cristiano, can you tell us a bit of the European fashion design history? From 1860 to 1960, haute couture’s designers were from Western Europe, specifically from Italy and France: Paul Poiret, Chanel, Elsa Schiapparelli, Salvatore Ferragamo, Christian Dior, Yves Saint Laurent, Roberto Capucci, Valentino, and so on. One hundred year of haute couture: a combination of fine materials, interesting silhouettes and … artisanship. Q. What happened after the 1960s? During the 1970s, fashion designers started to experiment with materials and techniques. Let’s think about Paco Rabanne and his clothes made with metals and crafted with hammers and pliers. Then, in the 1980s, catwalks saw the arrival of the prêt-à-porter (or ready-to-wear), a new sector of the fashion industry, in which North American (Calvin Klein, Ralph Lauren, Betsey Johnson) and Japanese (Issey Miyake, Yohji Yamamoto) designers occupied an important portion of the market. These are the times of mass production, and ten years later, of fast fashion with H&M and Zara. During the 1990s, technology and innovation started to be integrated with fashion design and the main exponent was, certainly, Hussein Chalayan, who created foldable dresses and motor-powered skirts. Q. What about the new millennium? Today, the fashion industry is composed of three sectors: haute couture, prêt-à-porter, fast fashion. In haute couture, Middle and Northern European designers are gaining great value. For example, Dutch fashion designers like Iris van Herpen and Viktor & Rolf. While fast fashion is being populated by numerous commercial brands, many Eastern European designers are “conquering” prêt-à-porter world: Ksenia Schnaider from Ukraine, Anton Belinskiy from Ukraine, Situationist from Georgia, Misbhv from Poland. These fashion brands have strong identities, historical and folk references that are new and exotic to Western consumers. Also, since the explosion of internet, prêt-à-porter is also been populated by a lot of independent designers. Q. What can you tell us about independent brands? Independent brands are businesses that are owned, run or managed by the designers or their families. They have a fair and transparent supply chain, and no sweatshops. Sustainability is their most important value: they don’t use fur or exotic skins, their products are chemicals-free and have natural or organic ingredients. In addition, they produce limited editions of products, which are made to last and to be worn season after season. In general, independent brands focus more on quality than on trends. Q. What did you suggest to the fashion designers at the African Fashion Designers Expo 2017? I think they should follow the example of the independent brands that make of sustainability and transparency their key strength and that produce high-quality products, in limited quantities. They should also focus their attention on the e-commerce and social media channels to reach the global market.